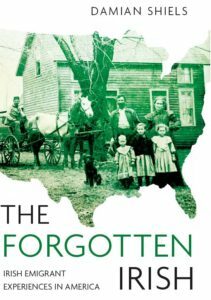 The last post on Irish in the American Civil War brought you part of the story of Bridget Bolen. The Co. Cork native had to petition the U.S. Government for amnesty in 1865 due to her falling within the 13th exception to the general amnesty, namely being a voluntary participant in the rebellion who held taxable property worth at least $20,000. Further research has now brought to light some information which outlines just how this Irishwoman participated in the Civil War. 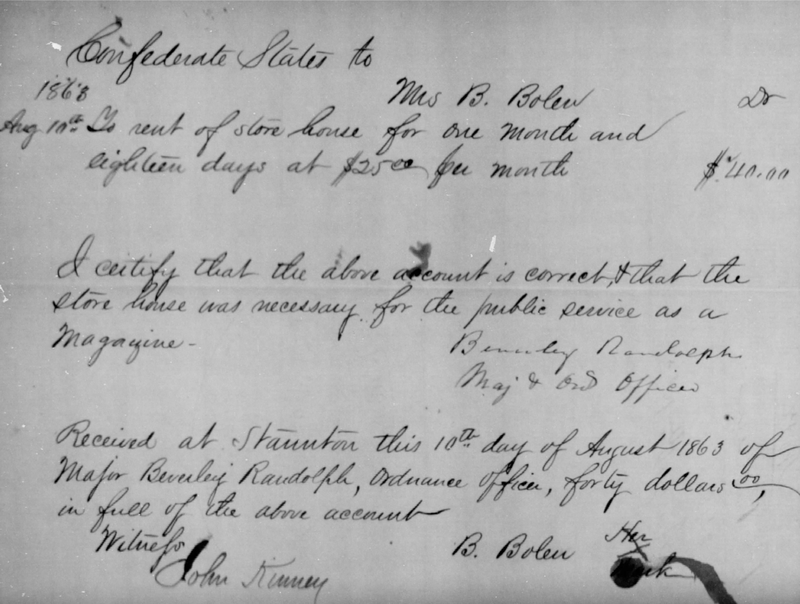 There are three documents in the Confederate Citizen Files which relate to Bridget Bolen. All are receipts from Confederate military authorities which provide details of monies due to her in return for goods and services received. 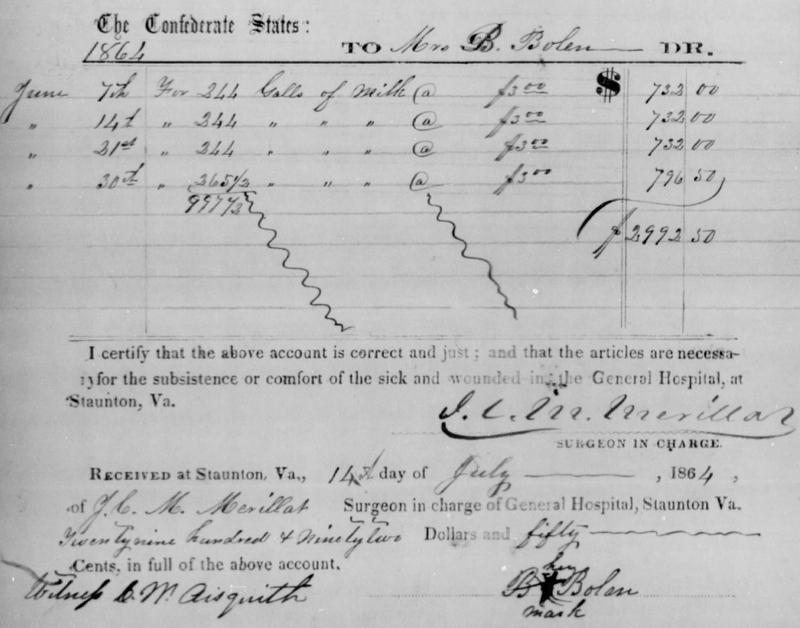 It is clear from the documentation that Bridget Bolen was running a large holding in the vicinity of Staunton, Virginia, and was called upon regularly by the Confederate military. The first of the documents dates to 10th August 1863 with the last the following summer on 14th July 1864. It may well be the case that there were further documents which date to earlier in the war that have not survived or are yet to be identified. What is certain from the available evidence is that the provision of supplies to the Confederacy was an extremely lucrative activity for Bridget Bolen. The first receipt is dated to 10th August 1863 and pertains to the rental for one month and 18 days of the Irishwoman’s storehouse, in order for it to be utilised as a magazine. For this she received the sum of $40. It was authorised by Major Beverley Randolph, most probably when that officer was serving in Fitzhugh Lee’s Cavalry Division (the nephew of Robert E. Lee). It is interesting to note that as with her amnesty petition, Bridget Bolen provides ‘her mark’ on the document; despite her wealth, it would appear she was illiterate. 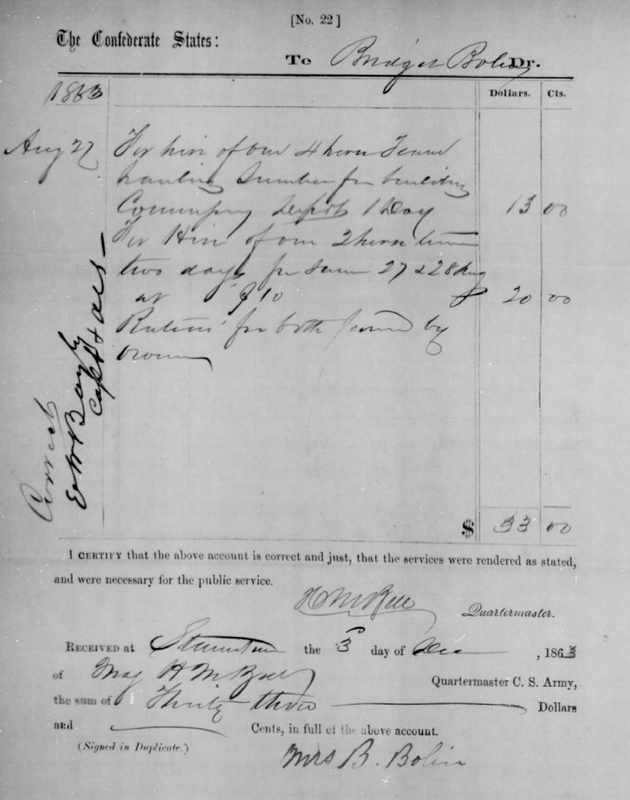 Later that month she was again called upon, this time renting out a four horse team and a two horse team in order for them to be used to haul lumber for the construction of a building, on this occasion receiving $33 in payment. The last payment in particular would indicate that Bridget Bolen was a woman who possessed considerable resources in the later war years, and most probably was the owner of a not insignificant amount of land. It also seems likely that she may have been a slaveholder, given the commitment in her amnesty appeal to ‘never again use slave labor’. As the search continues to find out more about this woman and her life, it is interesting to note an entry on the ‘Find A Grave’ site for a headstone in Thornrose Cemetery, Staunton, Virginia. It records the name ‘Bridget Bolen’ with the inscription ‘Mother. Died September 14, 1895, 70 years.’ Although the age of this woman suggests she was born around 1825 (as opposed to the c.1830 date which is indicated by her given age at the time of the amnesty petition), it seems unlikely that there were many women with the same name in Staunton, and this may well be the final resting place of the lady in question. To see the headstone click here. *With thanks to Jim Swan for information regarding the inflation of the Confederate dollar. A fascinating story of an unusual woman. Was she being paid in Confederate dollars? Indeed she was! I should have noted in the text that it was Confederate money as far as I can establish, which would have had a dramatic impact on the real value of the last bill in particular I imagine. I know at wars end the currency was practically valueless- do you have no any good references to see where it was at in 1864? It probably could do with a in-text clarification! The numbers I’ve seen are somewhat imprecise. However, I can suggest a couple of references. William C. Davis in his history “Look Away: a history of the Confederate States of America” (p.378) says: By March 1865 a dollar in gold in the Union was worth $1.46 in its paper currency; in the Confederacy it took almost $70 in Treasury notes to buy that same hard coin.” His reference is to R.C. Todd’s “Confederate Finance” published in 1954 in Athens, GA, but I don’t have access to that source. E.A. Pollard in his “Lost Cause” published in 1867 (p.652) says that in August 1864 the rate changed from 20:1 specie to 40:1 and went down from there to 60:1 in the following February. Apparently the value of Confederate currency in 1864 was complicated by an issue of new currency and withdrawal of old. In any case, you are right that the Confederate dollar was greatly devalued by 1864. Thanks a million for that info- I have amended the text slightly to reflect that, and must do a bit of reading into it!